CLICK GALLERY LINK ABOVE TO VIEW ARTWORK. 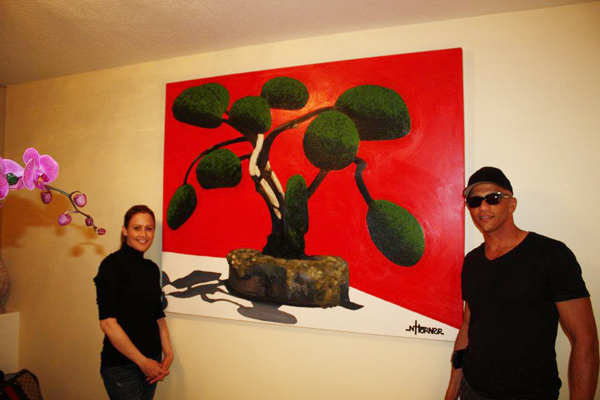 Available paintings are Price on Request. Go on a cyber voyage, see the Artists About Me (bio) which now includes links. 6/26/2016 with the Mayor of Beverly Hills Lili Bosse. 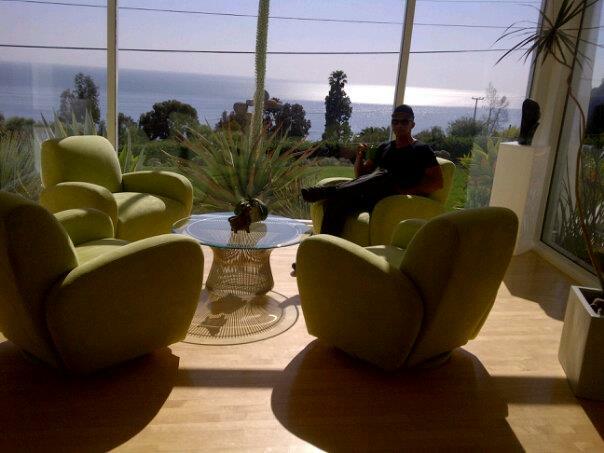 25 Years Malibu Celebration. 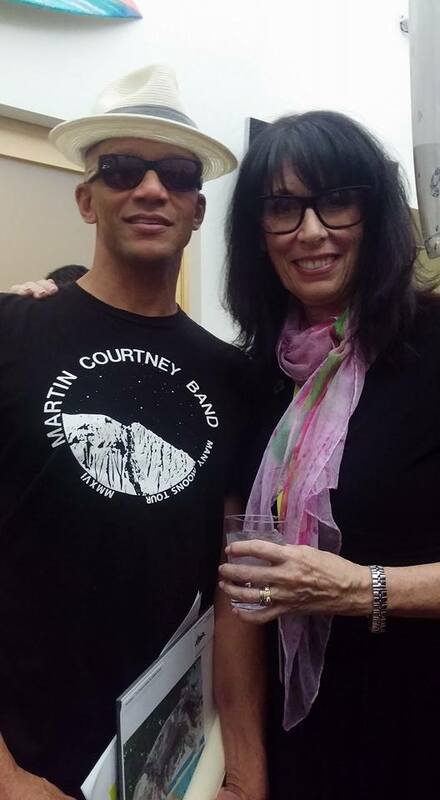 Malibu City Hall 3/28/2016 with the Mayor of Malibu Laura Rosenthal. 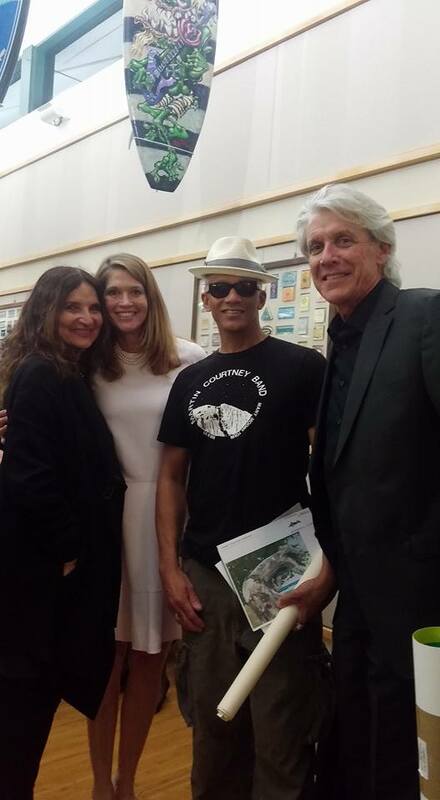 25 Years Malibu Celebration Malibu City Hall 3/28/2016 with Lita Albuquerque, and members of the Malibu Arts and Culture Commission, Suzanne Zimmer, and. 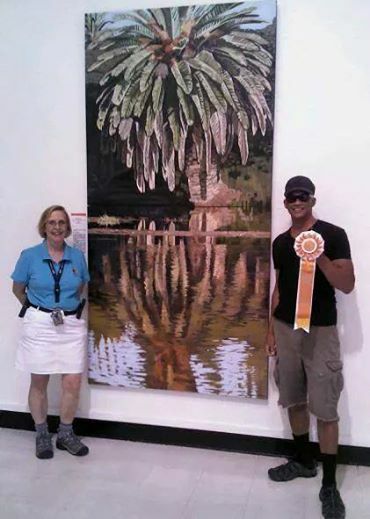 With this painting,(The Reflecting Palm of the Malibu Lagoon) I was one of only 11 Artists in the oil painting division, juried into the 161st Annual California State Fair / Cal-Expo Artshow July 11th-27th 2014. 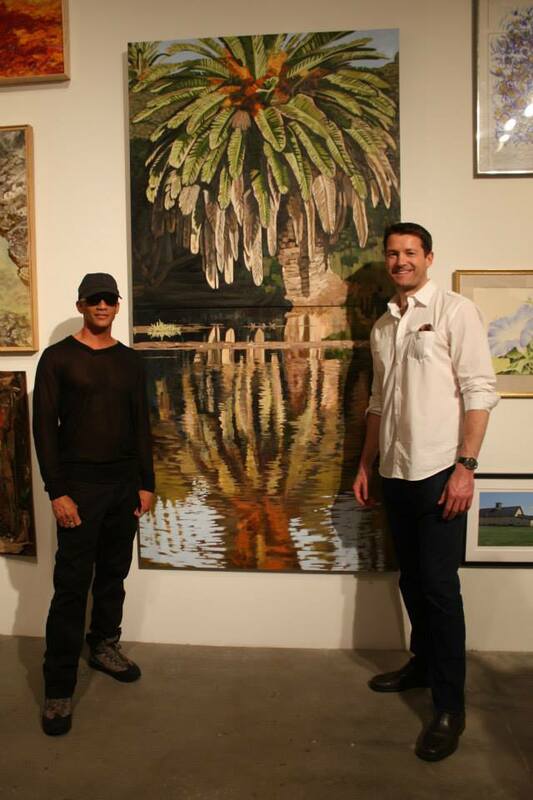 And the only oil painter from Los Angeles in the show. 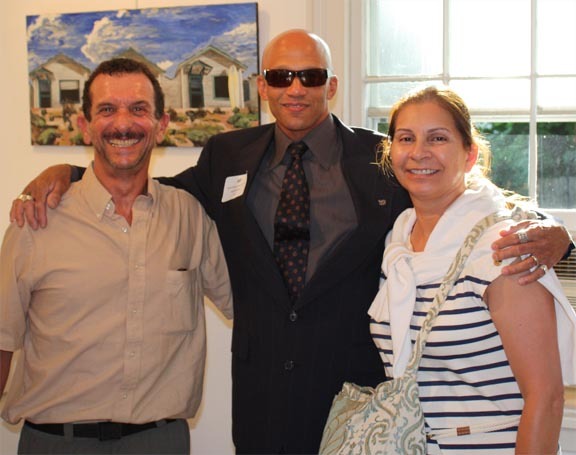 Nathan became the first artist from California ever invited to exhibit at The Edward Hopper House Art Center in Nyack, NY the childhood home of Edward Hopper. August 28th - October 10th 2010, 82 North Broadway, Nyack, New York. "I hope you always have the strength to keep doing what you are good at"
Please see Artist CV in News link. ARCLIGHT SANTA MONICA, from the evening of January 8th until March 5th, 2019. GUISADOS West Hollywood__8935 Santa Monica blvd. near Robertson. Nov. - Feb 2nd 2018. The Cave, at the Ventura Wine Company 9/1/17 - 1027/17. Arclight Cinema La Jolla, Nov. 15th - Jan. 3rd, 2017. Arclight Cinema Pasadena July 19th - November 7th 2016.
the news link in the header above, for the Artists CV / artistic resume. and see the artists lifestyle. 2377 Jefferson Street Suite #A San Diego, California. 1643 N. LAS PALMAS AVE.
Exhibiting- NAPTIME Medium: Oil on canvas Size: 36"x 48"
102 Japanese Village Plaza Mall Los Angeles, CA. 7013 Hollywood Blvd. LA, CA 90028 West of the Grauman’s Chinese Theater. 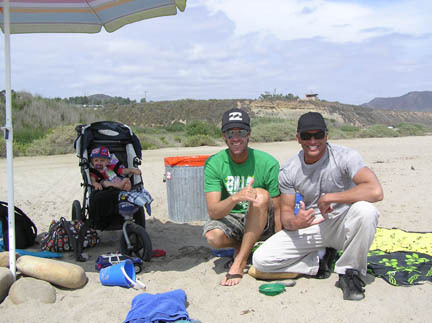 2009 the Powerhouse in Del Mar, CA. Arclight at the Sherman Oaks Galleria March 11th - May 19th 2009. October 2 – 12, 2008 one painting on exhibit . Sept. 26 - Nov. 1, 2008 one painting on exhibit . 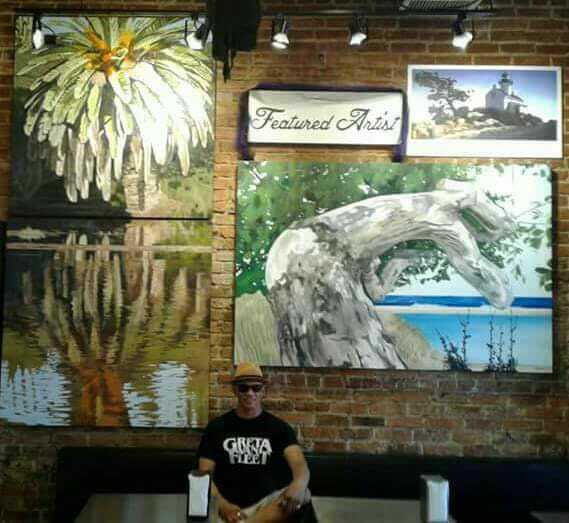 Neal's Art For Sale ! 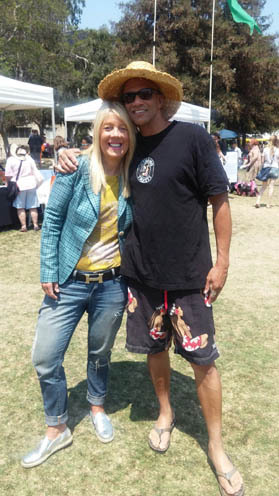 Why: To raise money for Legendary Pool and Vert Skateboarder Ray Underhill. Arclight Hollywood November 5th through Nov.18th 2007 during the AFI Film Festival. 1501 Cahuenga Blvd. Hollywood, CA. Corner of Cahuenga and Sunset Blvd. Seth McFarlane attended this reception. 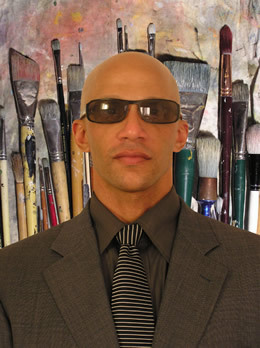 The New York Artist's Fellowship inc.
and all of my Patrons, Clients, and supporters over the years. 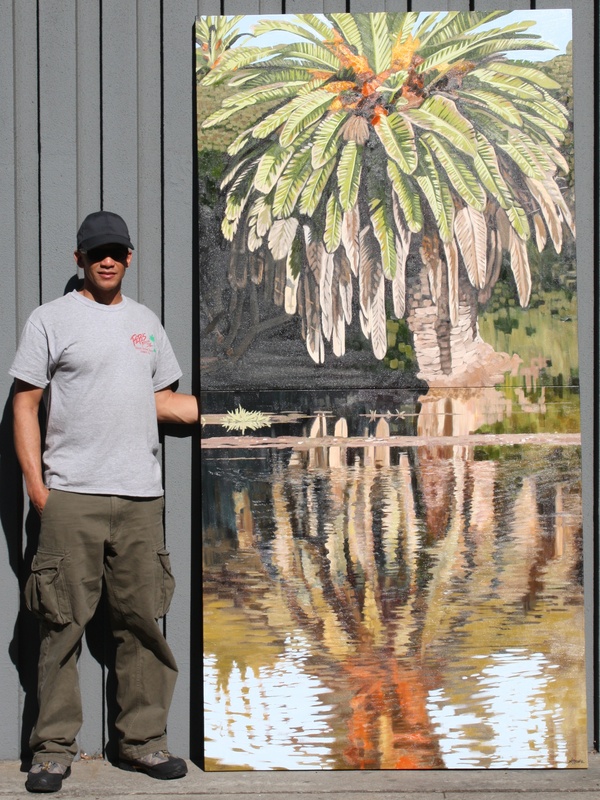 Published: Two of Nathanís paintings have been published in a book about San Diego County, illustrated with images by living artists. The book by author James Lightner is titled LAND OF SUNLIGHT, San Diego Flora third edition and went to press by May 31, 2007.† Approximately 400 paintings by 100 artists are included in the book. Nathans luminous Paintings that are included are: "Cabrillo Lighthouse" page 76, and "Tent City" page 89.
member The New York Artist's Fellowship inc.
My eye doctor / surgeon Dr. Anthony Aldave, of UCLA Jules Stein Eye Institute, with me at the Los Angeles Municipal Art Gallery Open Call Exhibit 2014. Wes Craven, the Director of "A Nightmare On Elm Street"
& "Red Eye","The Hills Have Eye's" and "The Last House on the Left", at the breakdown of Nathan's Arc Light Hollywood Exhibit. 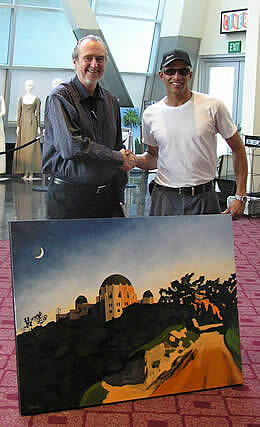 Wes purchased two paintings, "Dawn at Griffith Park" & "Beverly Drive". 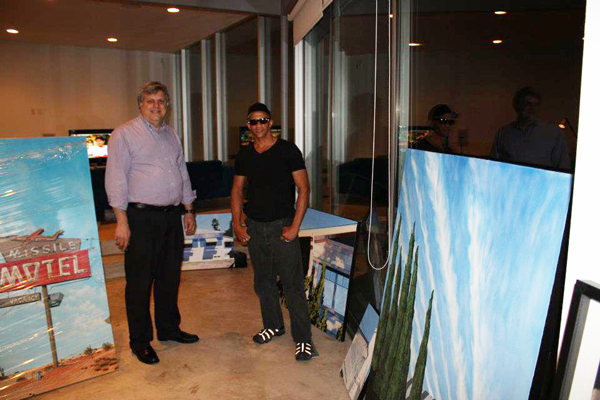 Four paintings sold in total at this show, two others " The Beverly Hills Hotel" & "Poolside at the Beverly Hills Hotel" sold to a couple, both are Executives in the film Industry. Author and Multiple World Champion Surfer Kelly Slater, at the annual Channel Islands Surf Team Party at the mother ship store on Melrose in West Hollywood, California 9/14/12 I got to hang out with many other Channel Islands surf team members that attended such as, Tom Curren, Lisa anderson, the Coffin Brothers, Lakey Peterson, Yadin Nicol, Sunny Garcia, Dillion Perillo, Kanoa Igarashi, Kalani Robb, Benji Weatherly, the Gudauskas brothers, the Curran brothers, and more. 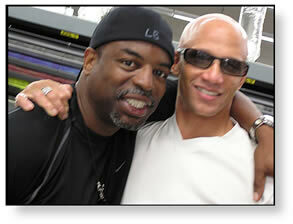 Join my personal Facebook page to see more pictures of this event and my lifestyle in general. 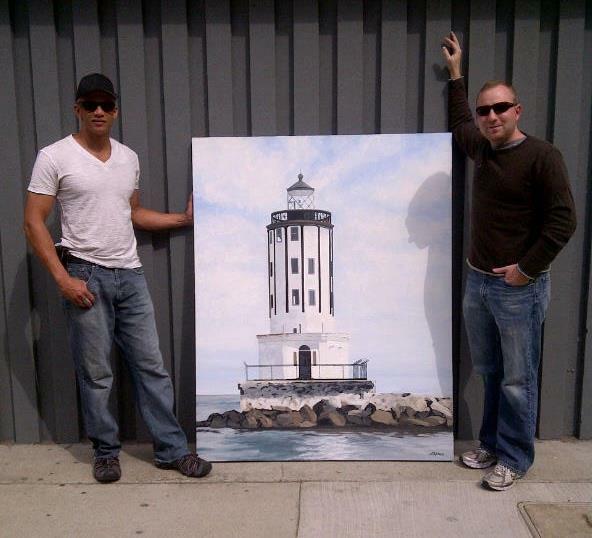 San Diego Art Collector John Hotham, purchasing my "Angels Gate Lighthouse" oil painting. 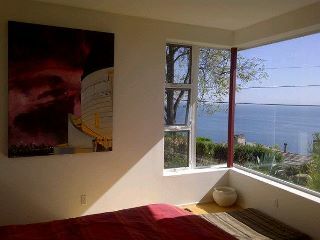 3/11/12 He also owns my original oil painting, "Talk To Me, Like The Sea". James M. Sears, M.D. 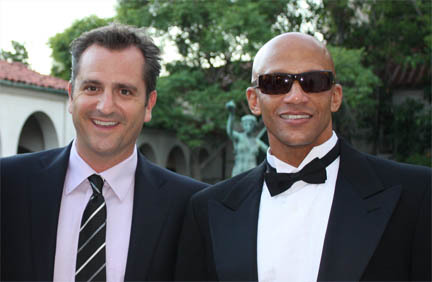 or "Dr. Jim" of the daytime TV show "The Doctors", and I, at the 5th Annual Evening Under The Stars October 10th, 2010. 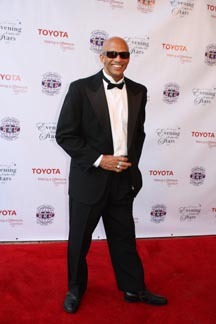 The event was held at The Ebell of Los Angeles.This Special Needs Network raises money to benefit kids with Autism. Thank you Areva Martin for all you do. 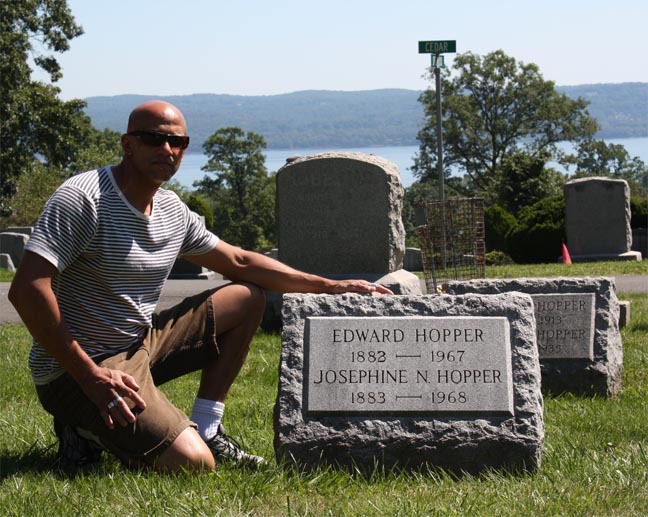 At the grave of Edward Hopper in Nyack, New York. He died in 1967, the same year I was born. 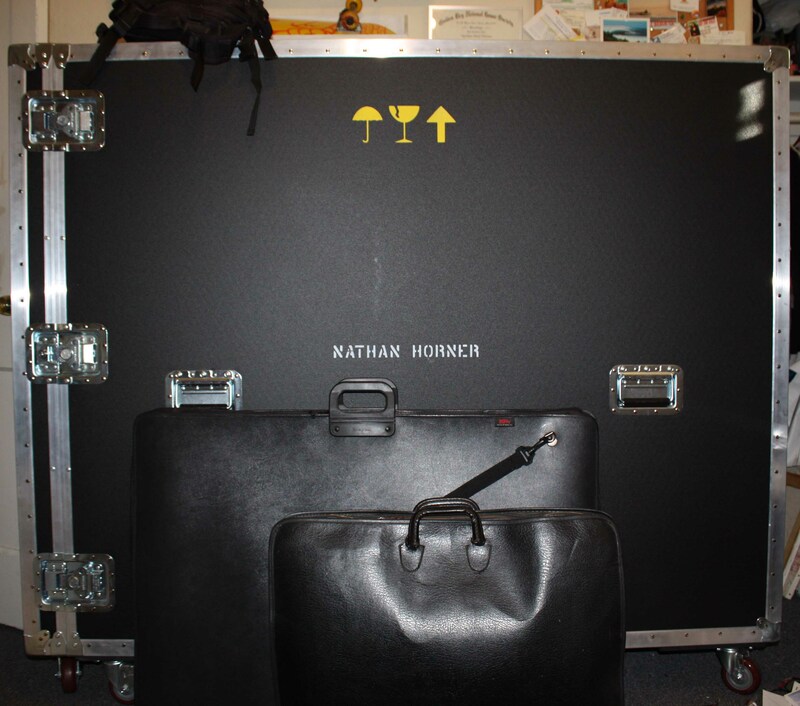 Trunk to store and ship my paintings to New York exhibit and future exhibits around the world. 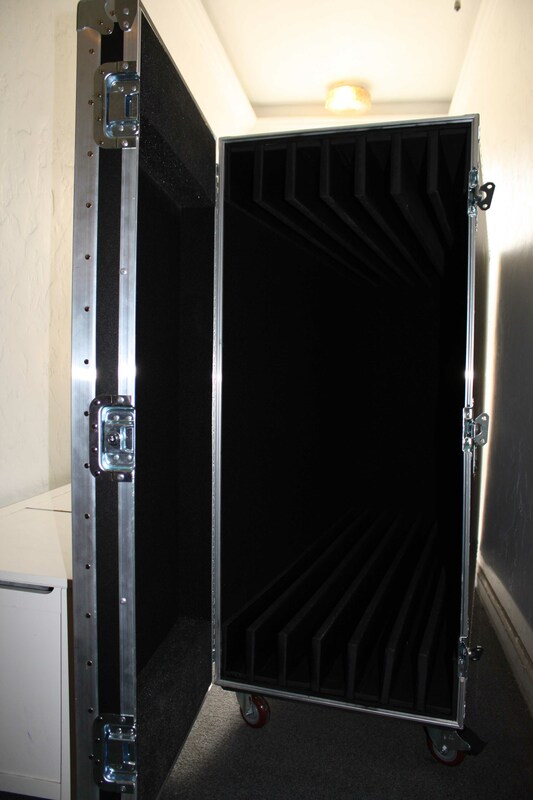 Thanks to George at Omega Case Company for a professional job. Holds up to 7, 48" x 60" paintings. 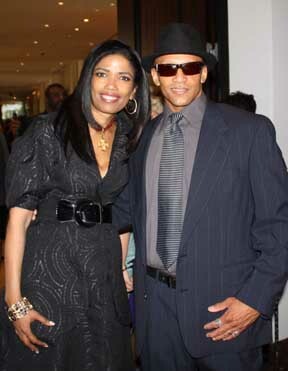 I was invited on May 2nd, 2010 by my friends Linda Valdry-Thomas and Micha Thomas to a luncheon at the Beverly Hilton. 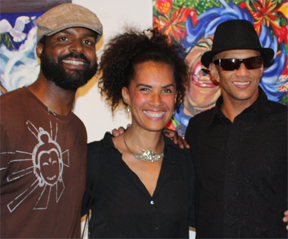 It was to celebrate the 25th anniversary of The Links Incorporated Beverly Hills West Coast Chapter. 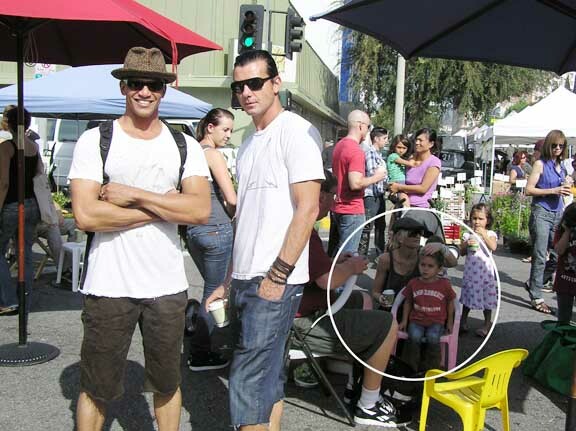 Lindas mother was one of its founding members. Wow! What a great organization (www.linksinc.org) and a great day in good company. 1416 N. La Brea Avenue Hollywood, CA. 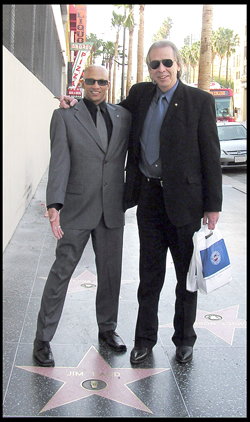 Legendary Rock & Roll Radio DJ Jim Ladd at his star on the Hollywood Walk of Fame on February 2, 2007 . This photo was taken after the 21st Annual, Celebrity filled, Hollywood Arts Council Charlie Awards Luncheon (notice the swag bags). The event was held in the Blossom Room at the Historic Roosevelt Hotel in Hollywood. Jim won the Award in the Media Arts.